Apparently there's an English version of this book coming out in the new year. Shame then that I've been sent a copy of the first Portuguese print run. Needless to say I'm not fluent in Portuguese. 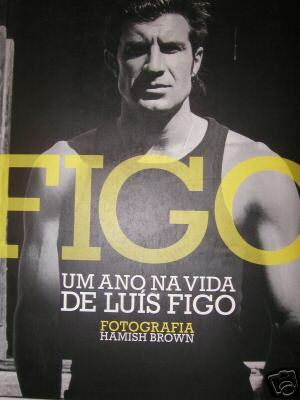 The bulk of the book though centres on Hamish Brown's year long photographic record of the former Real Madrid star. Hence we get photos of Figo clipping his toenails, warming up, posing with his missus, hugging his fans, causing allsorts of hatred on his return to Barcelona and, obviously, in action. There's cameos aplenty from the odd football legend as well as Real Madrid and Portugal players alike too. While Figo has been one of the world's greats this also featured on a time when the player was suffering a lapse in form and was to eventually depart from the Bernabeu. It might say this in the text but to be honest I haven't got the foggiest! 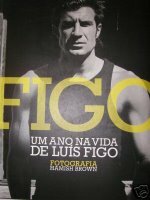 Whether posed or candid there's no denying the quality of Brown's photography, though if you're not a football completist or a Figo-obsessive it offers little more than a multitude of snaps of the rubber-faced wizard and his stunning wife. Unless you're Portuguese! I've been looking all over for this book on the net and I can't find a place that's selling it.